The commander and myself had stopped to take a smoke break and just talk about home. We only lived 20 miles apart and often talked about home and family. There was a young child watching us from a distance. I had some candy in my pocket, so I thought I would offer it to him. As he came toward us, his hands were behind his back and his head was down. I thought how he reminded me of my brother-in-law back home. He was, I would say, 10 years old at the most. As he got closer I noticed him raise his head and smile. Then out of nowhere his arms came from behind his back and in his right hand was a grenade. As his left hand reached for the pin, I had no choice except to shoot. I had to protect myself and the commander. I still see that face whenever I lay down to sleep. It won't go away and neither will the pain of what I had to do that day. God Forgive Me, I had no choice. Thank you for this contribution, James. I know other vets will benefit from reading your story, because some of them had to do the same kind of thing. The reason that stays with you so strongly is that you are not the kind of person to do something like that. And you would not have, if you had any other choice at the time. Here are a couple of things you can do, if you choose, to heal this type of memory. 1) Imagine yourself as the man you are today, going back in time to that moment. Remember, you can stop action, slow things down, or even reverse the action. 2) First, go up to the child, and gently but firmly take the grenade from his hand, pin still in place. Tell him he can go home now, and that he doesn't have to do that any more. Then picture him in the loving arms of (fill in the blank here--your choice). 3) Then go to the younger you--the soldier that had to shoot the child. Look into his eyes, and say, "I'm so sorry you had to do this. It was not your fault. But it wounded you. You can come home with me, now, and I'll take care of you." 4) If he's willing to come with you, bring him into your current life, show him around all of the good things, and say, "This is where you live now. You're a good man. You were a good soldier, and you did what you had to do. And now you can heal from those wounds." 5) If your current life is not a safe or happy place, take him to a real or imaginary healing place. Then watch over him, take care of him, and tell him everything he needs to hear while he heals. 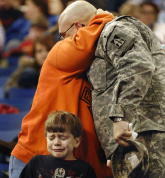 6) Don't be afraid to hold or hug the younger soldier-you during this process. He needs to know he's okay. He's been in shock ever since the event occurred, which is why you've had that memory so strong. 7) Now look back at the location of the memory--the younger you and you--and notice that you, the commander and the child are not there any more. It's over. 8) It might help to put the child to rest in your mind, meaning, have a funeral for him. Tell him you're sorry that he was given that job at such a young age. Tell him you're sorry you had to kill him. Feel his forgiveness. It's there, just open your heart to it. I hope this helps, James. If it doesn't seem to fit for you, don't worry about it. Just use this if it feels right for you. Feel free to respond using the comment form, or write another story if you choose. James, My name is Wayne. I am retired military and I also work with Veterans. I see a lot of Vets every week. What you experienced was a true horror and it is also something that I have heard of from many other Veterans. I have heard of many cases just like this one where a child, who had been brutally brainwashed into becoming a killer, eventually just can't take it anymore and tries to get a soldier to kill him. These children are well trained to hold a grenade behind themselves, carefully pull the pin, count and then throw the grenade, or to turn around where the soldier cannot see what he is doing, and then pull the pin. The count behind the back is so that when they eventually throw the grenade, the enemy doesn't have time to react. They KNOW that for them to move the grenade to the front of their little bodies where the grenade can be seen and then go to pull the pin, it will give the enemy time to react and kill them. If you had not killed the child, the child would have done this with the next soldier to come along. You are not a murderer, it is my opinion that this child committed suicide. This story has been told in many wars. The war in the Desert, in Viet Nam and the wars that preceded it. You have inside of you the memories and feelings from the war that you have been forced into. It is now time for you to slowly, gently and patiently, take those memories out, one at a time. Be in the memory to allow yourself to feel your own real feelings about what you experienced. It will be about crying, grieving, raging, sadness, betrayal, confusion, loss and other feelings that are now stuck in your body, making you tired, sore, and in turmoil. As you are able to move through these memories and feelings, you will begin to feel better within yourself. It will not mean that you will forget what happened but it will mean that you find an answer for YOU about what happened. Going through this will allow your body to heal. It is not comfortable to do this. It does feel like huge loads are taken off of you as you move through the memories and feel your real feelings of the moment. You will find peace. You do not have to do this by yourself. There is help out there for you. There are places called Vet Center as well as the Veterans Administration. There are many books on what your are going through. I commend you for writing on this web site. It shows you are wishing to heal as well. Dr. DeFoore's site is set up to help you heal. It is one tool in a possible larger tool box of things that are out there to help you. Welcome home and I am grateful that you have come home in one piece. Now take the time to become whole again and God Bless. Join in and write your own page! It's easy to do. How? Simply click here to return to Veterans PTSD.